I know I said last time that the Shoreline/Blanc mashup was our most popular “Sew This Look” post ever, but that was before this one! 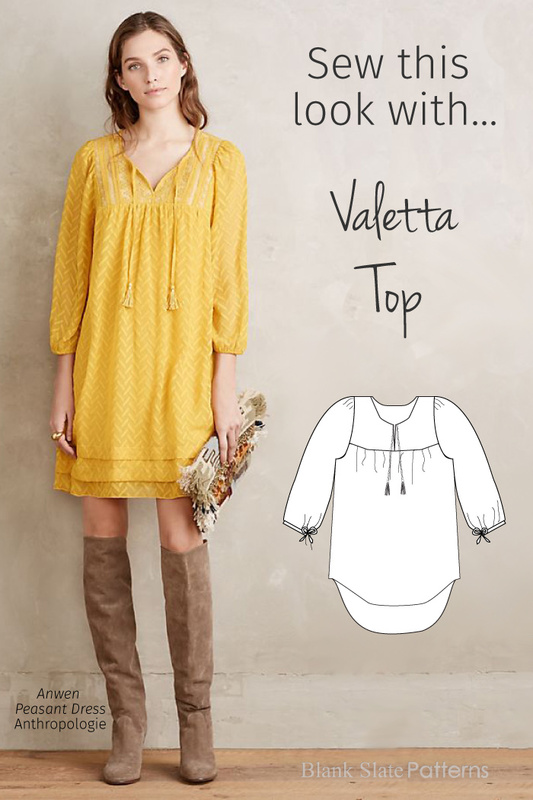 This dress from Anthro is not hard at all to recreate with the Valetta pattern. First, you’ll need to figure out the adjusted length. It will be helpful if you’ve already made a Valetta Top that you can reference to see the length on you personally, but if you haven’t, you can just estimate extra and trim off as needed after trying it on. The bottom of the side seam hits about mid-hip for most people (see the photos in the listing to get an idea). Measure how much longer you would want your dress to be; the inspiration garment hits a couple of inches above the knee. Now, add 4″ more to that. Add this total length to the side seams of the front and back pattern pieces, marking straight down, parallel to the center fold. Make sure your side edges are still the same length on both pieces. After straightening the hemline, your adjusted pattern pieces will look something like the below (though this one is not to scale). Press the lower edge 8″ to the inside, being careful to measure evenly all around as you crease. If it’s easier, you can mark a line 8″ up from the bottom edge and then use that as a guide for your crease. Be sure to use a marking tool that will wash out — test first! Pin around so that it doesn’t shift. Sew a line of stitching 1″ in from the folded edge. Press towards the bottom. Press the lower edge 4″ to the inside, just as you did before. Pin, then stitch again at 1″ from this folded edge. Press towards the bottom. Hem as directed in the pattern (1/2″ hem allowance).